Does Your Diabetic Parent Have Gastroparesis? Home Care Arlington TN – Does Your Diabetic Parent Have Gastroparesis? Gastroparesis is a condition in which the stomach does not empty as it should, causing a delay in the digestion of food. The most common cause of gastroparesis is diabetes. It most often happens when a person has had diabetes for ten or more years or if there are other complications present. If your parent has diabetes, knowing more about complications like gastroparesis can help you be on the lookout for problems and get your parent the help they need. What Causes Gastroparesis in Diabetics? In a normal digestive system, the muscles that move food through the stomach are controlled by the vagus nerve. It signals the muscles to contract to break food apart and move it along the gastrointestinal tract. But, sometimes diabetes damages the vagus nerve, causing it to work less efficiently or to stop working altogether, resulting in gastroparesis. For some people, gastroparesis is a mild problem. In others, it can lead to more serious complications. The food may cause sugar spikes when it finally moves into the small intestine. When it remains in the stomach for too long, food can ferment and cause too much bacteria to grow in the stomach. Food may also form hard lumps, called bezoars, that can block the intestines. What Can Be Done to Help Seniors with Gastroparesis? In addition to seeking medical treatment, family caregivers and home care providers can help older adults to control symptoms of gastroparesis by assisting them with altering some of their eating habits. For example, experts say that eating six small meals instead of three larger ones can help. They also recommend sitting upright during meals and eating slowly. Taking a walk after eating can also help. Certain foods can also impact gastroparesis symptoms and the rate of digestion. Your parent’s doctor might suggest that they avoid foods that are high in fat or fiber. Fat slows the rate of digestion. Fiber can be hard to digest so that it sits in the stomach longer and increases the chances of forming a bezoar. 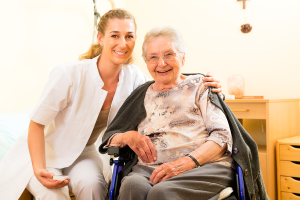 If your parent has gastroparesis, a home care provider can help them to control the symptoms. Home care providers can prepare small, healthy meals that limit the amount of fat and fiber your parent eats. They can also walk with your parent following meals, making walks more fun and also ensuring their safety. This entry was posted in Challenging Diseases/illnesses/Conditions, Home Care Arlington TN and tagged Home Care Arlington TN. Bookmark the permalink.